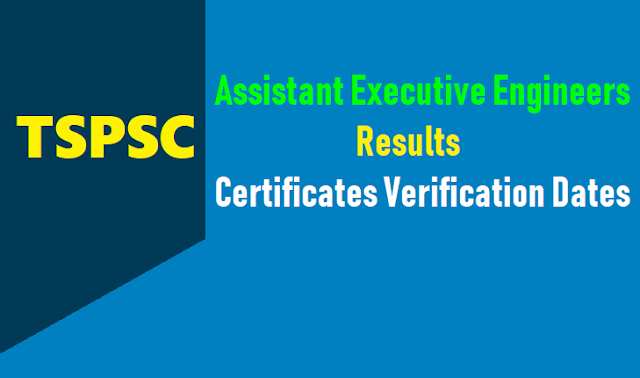 On the basis of the results of the written examination held on 01-04-2018 and Oral test (Interview) held from Dt: 24-09-2018 to 03-10-2018 at TSPSC Office, Hyderabad to the post of ASSISTANT EXECUITIVE ENGINEER IN RURAL WATER SUPPLY AND SANITATION Department, the following Hall ticket numbers have been provisionally selected for appointment to the post of ASSISTANT EXECUITIVE ENGINEER IN RURAL WATER SUPPLY AND SANIATION DEPARTMENT vide Commission’s Notification No.64/2017, Dt: 17-11-2017. The selections are published here with subject to the following conditions. 1. In Continuation of the result Notification dated 19/07/2018,It is hereby notified that onthe basis of the computer-based examination held on 1-4-2018 to the post of Assistant Executive Engineers in Rural Water Supply and Sanitation Department, the candidate with the following Hall ticket Numbers have been provisionally admitted for the Verification of Certificates. 2. The candidate who are admitted for the verification of certificates are required to produce the Original certificates along with one set of Photostat copies duly attested by Gazette Officer,, relating to Age, Qualifications, Community (Integrated),Latest Creamy Layer exemption certificate in case of B.Cs as per Memo No.3009/BCW/OP/2009, Government of Telangana, Backward Classes Welfare (OP) Department, Dt:18/12/2015 (prescribed format hosted on website), Certificates relating to claim of age relaxation, , Study (from 4th class to 10th class) basic information data (Check list (1 set) attestation forms ( 2 sets) and if any, at the time of verification of documents, failing which, they will not be admitted in subsequent process of selection. No request will be entertained for subsequent submission of any of the above certificates. In terms of the notification, the candidate should possess the requisite qualifications as on date of notification i.e., on 17-11-2017. 3. The Verification of Certificates will be held in the office of TSPSC at Prathibha Bhavan, Nampally, Hyderabad on 09 /08/2018 from10:00 A M onwards.